Greenland is experiencing a early spring thaw. The 2012 melt season, according to the National Snow and Ice Data Center, experienced melting even at mountainous heights over a mile into the sky atop Greenland. 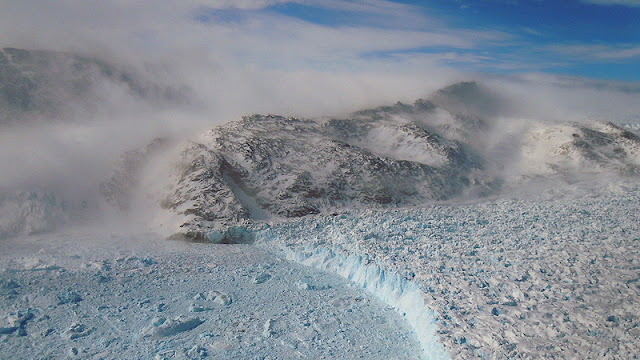 “During a peak melt event in July, even the summit areas of the ice sheet, nearly two miles above sea level, saw snowmelt conditions,” the group wrote. “While this has been observed in ice cores a handful of times in the past 1,000 years, it had not previously occurred in this century.” That’s not normal. A vast region of Greenland is experiencing a freakishly early spring thaw. Summer-like temperatures—a balmy 10 degrees Celsius (50 degrees Fahrenheit)—have created a melt area encompassing 12 percent of the planet’s northernmost ice sheet, according to analysis by the Danish Meteorological Institute (DMI). Almost 12% of Greenland’s ice sheet was melting on Monday, according to data crunched by the Danish Meteorological Institute. It beat by almost a month the previous record for a melt of more than 10%, on 5 May 2010. “We had to check that our models were still working properly,”6 Peter Langen, climate scientist at DMI, told blog Polar Portal. Temperature readings on the ice were in line with the numbers, however, exceeding 10C in some places. Even a weather station 1840 metres above sea level recorded a maximum of 3.1C, which data analysts said would be warm for July, let alone April. Greenland’s usual melt season runs from early June to September. “Too much. Too early,” tweeted the World Meteorological Organisation. Widespread melting on the Greenland ice sheet typically doesn’t get going until May. In fact, the three earliest dates for a melt area exceeding 10 percent are May 5, 2010, May 8, 1990, and May 8, 2006. “It is a very unusual situation, especially so early in the year,” climate scientist Martin Stendel said in a blog post, adding that cold air and low pressure systems to the east and west of Greenland have forced a warm air “cap” over the island. Researchers attributed the surprising early melt this year to weather conditions, and more specifically, a warm midlatitude air mass getting stuck over the ice sheet. “The strong south air flow onto Greenland has produced warm air, rain instead of snow, and melting of snow that is in Nuuk,” Greenland’s capital, Jason Box, a researcher with the Geological Survey of Denmark and Greenland, said by email. So, what’ll happen to all that meltwater swimming atop of the ice sheet this week? In all likelihood, temperatures will soon drop, and it’ll percolate into the snow and refreeze, meteorologist Ruth Mottram of the DMI told New Scientist. But by doing so, the meltwater will carry heat energy to lower depths, reducing the amount required to thaw the ice out later. And if past years are any indicator, Greenland is in for another hot, melty summer. In other words, time to bust out your rain boots if you live in Miami.